The carriges for one are Eruopean not American espcially with the SNCF on the side. Also if it was Grand Central or Pennsylvania Station they would have been using all electric locomotives. Only Hoboken or Weehawken across the Hudson would have maybe still had steam locos. Well the "box" cabs like # 1212 below would have pulled the passenger trains in & out of Grand Central Station after it was rebuilt and the tracks dropped below Park Avenue and covered over. 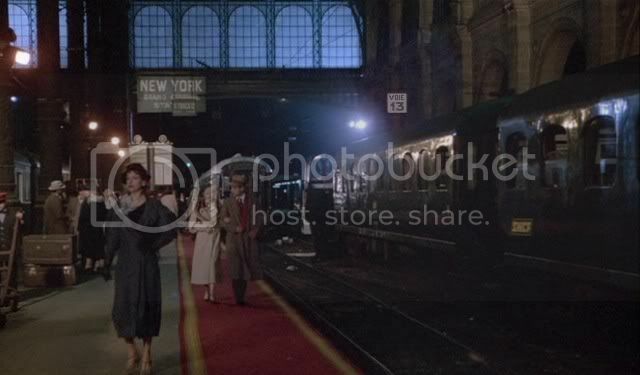 If it was Penn Station the passenger trains would have been pulled by the tuscan red GG1's like below. that & the fact that they are pretty much silent compared to Steamlocos. There are a lot of old buildings in NYC that still bear the signs and artifacts of former uses. Hey Jenkins, maybe "Bailey" had something on Johnson. Nice pic A1. Maybe Fartface and the other guy were fond of taking Turkish baths together. An old topic on missing scenes: http://www.fistful-of-leone.com/forums/index.php?topic=573.msg4199#msg4199 Some stuff I didn't know. The coffee stirring scene also introduces the audience to Max's throne. In Sir Christopher Frayling's book Something To Do With Death, Frayling hints that the idea of the throne may have been invented by Leone. This is incorrect. The throne is the book The Hoods - chapter 44 p.420. ...a throne, a royal relic of some sort. I examined it more closely. The keynote of the carved design was the royal flag of Rumania which appeared among icons and all sorts of royal insignia and armorial bearings. Was it possible that excesses with a degenerate woman could weaken a man mentally? I had heard a man could develop softening of the brain by that sort of perversion. And was this thronelike chair one of the manifestations of his delusions of grandeur? It's a throne. It was a gift to a pope. Cost me 800 bucks. It's from the 17th century. So, what are you doing with it? The throne is one of the first signs that Max is losing it / becoming a megalomaniac.